Our planet could be such a wonderful place, but it’s spoiled by injustice, poverty, hunger and greed. There’s a huge gap between “the World as it is” and “the World as it should be”. Did he mean the Kingdom was physically present? Or was he saying it was on its way? Or both? Theologians sometimes use the phrase “now and not yet” to describe the Kingdom of God. The promise will only be fulfilled at the end of time, but a bit of tomorrow often breaks through into today. Christians are called to turn “the World as it is” into “the World as it should be”. It’s one way we can welcome the “now and not yet” Kingdom. We could sit around and moan about the state of the World – or hold conferences to discuss what “someone” could do. Or we could join with God in taking action to make things better. We can be the hands and feet of Jesus in a world that needs him more than ever. I became a vicar because I wanted to change the world. I admit I was a little young and idealistic, but I wanted to make a difference, and I thought that following Jesus was the way to go. Unfortunately, I spent a lot of time preaching sermons, organising events and running meetings. I’m sure it was all good, but it wasn’t what I thought God was calling me to do. Ten years ago, I was introduced to Citizens UK. Citizens is well-known for its campaigns about refugees and the Living Wage, but the core of its work is grass-roots community organising. 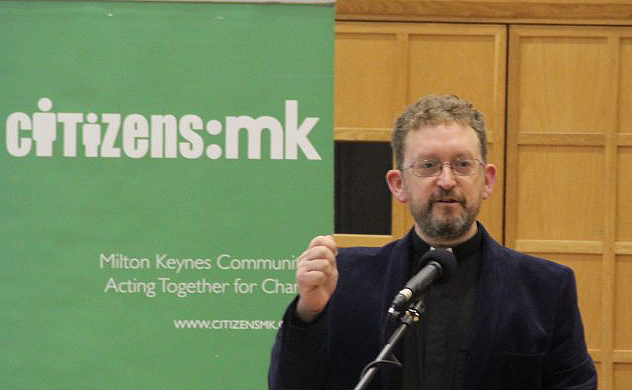 Community organising helped me to rediscover my calling as a Christian. I learned a set of tools which enabled me to move from vision and values to action and change. Many of those tools were very familiar, but Citizens helped me to join the dots. I’ve actually had a lot more fun as a result of community organising. Some of my best moments have happened as a result of this wild ride: welcoming Syrian refugees at an airport; getting to know Muslim neighbours; meeting politicians or negotiating with business leaders. It’s been particularly brilliant to see other people pick up the tools and transform their churches, neighbourhoods and cities. Citizens UK is proud to be an associate partner with Greenbelt this year. We’re delighted to be part of a festival that has a passion for justice at its core. We’ll be sharing some of our exciting campaigns and projects, but we also want to encourage churches to think about community organising as a method which builds disciples, transforms communities and challenges injustice. Together, I hope we can bring some of “the World as it should be” into “the World as it is”.